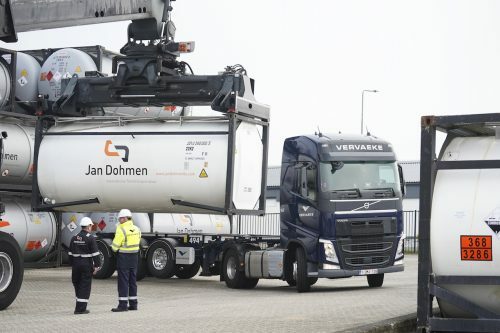 This acquisition provides Vervaeke, European leader in tank transportation for the chemical and petrochemical sector, a strong position in multimodal transport, not only in Europe but also globally and brings the Dutch company Jan Dohmen in a new growth cycle. Family owned company Jan Dohmen has developed since it was founded in 1912 in Herkenbosch (The Netherlands) into an important European intermodal logistics service provider in bulk liquid and gasses. Jan Dohmen possesses a fleet of over 700 tank containers and is specialized in intermodal, deepsea, gas and on-site logistics. Jan Dohmen represents a turnover of above 20 million euro and 70 employees in several locations. In Herkenbosch, the company runs an important storage site and maintenance center. All directors and staff remain on board. Vervaeke reaches, after the takeover, a turnover of 140 million euro with a fleet of 750 trucks, more than 1000 tank trailers, 750 tankcontainers and a team of 950 employees. The group offers tank transport out of thirteen sites spread around the Benelux, France and Germany and is focused to deliver demanding logistics services to the chemical and petrochemical industry. A continued process of both technical innovation and professionally trained local staff secures these services. Thanks to its great expertise Vervaeke stands for an advanced specialization and tailor made solutions. Jan Dohmen also emphasizes knowhow and customer satisfaction, though targeting mainly multimodal services, by rail or by boat. Jan Dohmen provides through its motivated and local staff a large range of services with added value, offering to their faithful customers in the chemical sector an adapted logistic response. These activities and their strong reputation represent the key elements for the strategic acquisition. Vervaeke has already doubled its core business through a former takeover, transport company van der Lee in 2017, and as a result has extended its geographical presence in the biggest chemical cluster in Europe.